Description: This tree is usually 30-40' tall at maturity (rarely up to 60' tall), consisting of a short trunk and a wide crown with ascending to widely spreading branches. The crown is usually somewhat open and irregular. On mature trees, the trunk is up to 1¼' across, consisting of flattened gray ridges and shallow reddish brown furrows. The twigs are light gray to reddish brown, more or less terete, with scattered small lenticels. Young shoots are light green, terete, and glabrous to minutely pubescent. 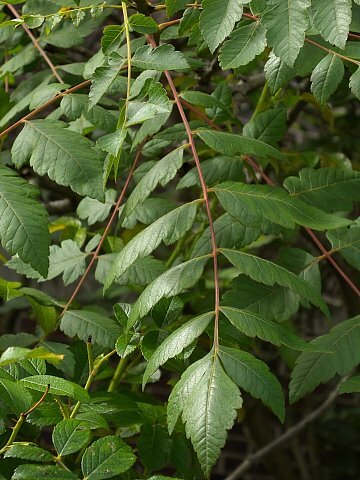 Alternate compound leaves about ¾-1½' long occur along the twigs and young shoots. These leaves are either single-pinnate or partially bipinnate. Individual leaflets are usually 1½-4" long and 1-2½" across; they are lanceolate to ovate and either coarsely toothed or shallowly cleft. On bipinnate leaves, there are 1-2 pairs of secondary leaflets below some of the primary leaflets. These secondary leaflets are similar to the primary leaflets, except they are smaller in size and more narrow in shape. The upper leaflet surface is medium green and glabrous, while the lower leaflet surface is light green and either glabrous or minutely pubescent along the central vein. The leaflets usually have short petiolules (up to 1/8" or 3 mm. long), although some leaflets may be sessile. The petiolules are light green to light yellow-green and glabrous to minutely pubescent. The central stalks (rachises) of the compound leaves are light green to red and glabrous to minutely pubescent. Twigs occasionally terminate in panicles of flowers about ¾-1½' long and at least one-half as much across. Each flower is about ½" across, consisting of 4 yellow petals, 4 green sepals, 8 stamens, and a pistil with a single style. While a flower is in bloom, the petals are widely spreading or recurved and they are narrowly lanceolate to lanceolate in shape. The sepals are lanceolate in shape and much shorter than the petals. At the base of each petal, there is a pair of small scale-like appendages that are yellow to orange-red. On the stamens, the lower halves of their filaments have long hairs. Both the style and the stamens are strongly exerted. On some trees, some of the flowers may be unisexual. The pedicels of the flowers are green and either glabrous or minutely pubescent. The peduncle and lateral stalks of each panicle are also green and either glabrous or minutely pubescent. The blooming period occurs during the summer (usually mid- to late summer in Illinois) for about 2-4 weeks. The flowers are mildly fragrant. Fertile flowers are replaced by inflated seedpods that become 1½-2½" long at maturity. These seedpods are obcordoid and strongly 3-lobed in shape; immature seedpods are light green to bright red, while mature seedpods are light brown to blackish brown. Each seedpod contains up to 3 seeds (1 seed per lobe). Individual seeds are globoid or globoid-ovoid in shape and 6-8 mm. in length. Because the seedpods are light-weight and inflated, they can be blown about by the wind or float on water. The root system is woody. This tree spreads by reseeding itself. Cultivation: The preference is full or partial sun, well-drained conditions (moist to dry-mesic), and soil containing loam, clay-loam, gravel, silt, or sand. This tree is hardy to about Zone 6 (southern Illinois). In more northern areas of the state, some cultivars of this tree can survive several winters if they are planted in sheltered situations near heated buildings. Range & Habitat: The introduced Golden Rain Tree rarely naturalizes in Illinois. So far, such trees have been observed in only a single county in southern Illinois. 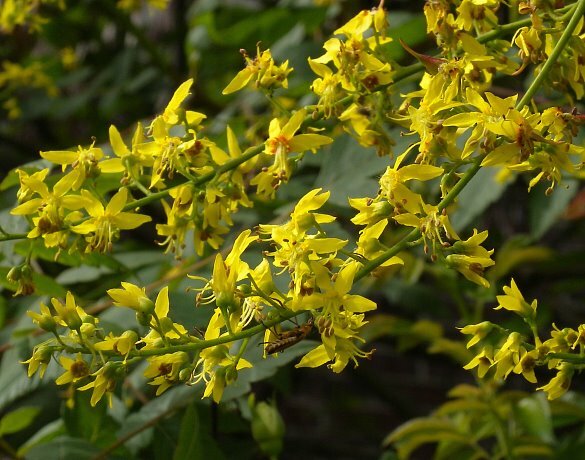 This is mainly because the Golden Rain Tree has trouble surviving the relatively cold winters in Illinois, particularly in the central and northern sections of the state. However, in many southeastern and south-central states further to the south, such naturalized trees are more abundant, and in some of these areas it is considered invasive. The Golden Rain Tree is native to east Asia (primarily China & Japan). 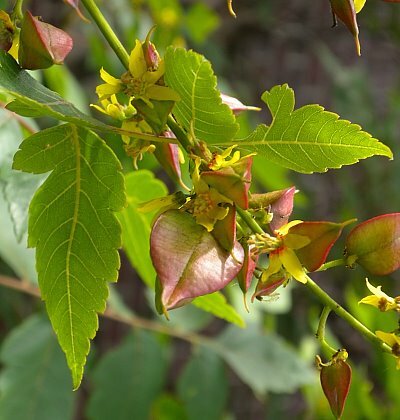 It was introduced to North America as an ornamental landscape tree. This tree naturalizes in such habitats as urban parks, roadsides, vacant lots, edges of yards, and other disturbed areas. In east Asia, it occurs in natural areas along seashores, secondary woodlands, and open areas. Faunal Associations: For North America, the floral-faunal relationships for the Golden Rain Tree are not well-understood. The showy flowers are cross-pollinated by bees and probably other insects that seek nectar and pollen. A leaf-cutting bee that has been introduced from Asia, Megachile sculpturalis (Giant Resin Bee), is known to be one of the pollinators of this tree in the southeastern United States. In North America, insects that feed destructively on this tree appear to be few in number at the present time. The larvae of a Buprestid beetle, Chrysobothris purpureovittata, bore through the wood of dead branches (observed in Missouri). Another insect, Jadera haematoloma (Golden Rain Tree Bug), feeds on the seeds. The foliage of this tree is considered toxic to horses, cattle, and probably other hoofed mammalian herbivores. Photographic Location: Near an office building in Urbana, Illinois. Comments: This attractive small tree is the only species of its genus that has naturalized in Illinois. Two similar species are sometimes cultivated in the United States: Koelreuteria bipinnata (Chinese Flame Tree) and Koelreuteria elegans (Chinese Rain Tree). These two trees differ from the Golden Rain Tree (Koelreuteria paniculata) by having compound leaves that are fully bipinnate. The Golden Rain Tree, in contrast, has compound leaves that are either single-pinnate or partially bipinnate. The common name, Golden Rain Tree, refers to its abundant yellow flowers falling like rain, creating a carpet of yellow on the ground.